Congratulations to all successful examinees of L.E.T for Secondary level. The results of the Licensure Examination for Teachers (LET) held in March 2015 are released online. This page was made to help you find the list of passers of the said exam. The Licensure Examination for Teachers (L.E.T) in Secondary level conducted on August 2014 have gathered the 26,767 secondary teachers out of 77,803 examinees. Please be patient while waiting the official results of L.E.T. For now, bookmark this page so you could see the updated list of passers for March 2015 Licensure Examination for Teachers. The members of the Board of the Professional Teachers Dr. Rosita L. Navarro; Chairman, with Dr. Paz I. Lucido, as Vice Chairman; Dr. Paraluman R. Giron and Dr. Nora M. Uy, Members. We expected the official results to be released on this week of May 2015 based on the standard counting of the releasing date by PRC. 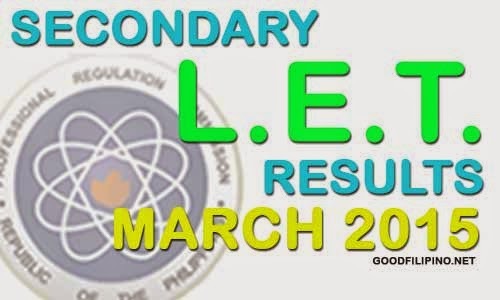 Comments or suggestions about "L.E.T Results 2015 | March 2015 Secondary (Alphabetical) LET Results: E – F – G – H" is important to us, you may share it by using the comment box below.